Man oh man, I was doing so good in April! I got a number of posts up and was on top of my updates… but for some reason I’ve been having a hard time over the past few weeks trying to find the motivation (and time) to sit down and get stuff written up (even my Instagram has been severely neglected). Believe it or not, blogging is a lot harder than it looks, and there’s a huge amount of time that goes into every post – such as the actual writing, grammar checks (which is actually not my forte, but I actually feel like this “hobby” has somewhat helped me improve in this particular area over time), photo editing, and post formatting. The end result always makes it so worth it, as I now have this beautiful journal/scrapbook documenting our life, and I love going back and reading through old posts of mine all the time! I definitely need to take the time and get it printed into hardcopy, and I would love to have the motivation to blog about other things I’m actually passionate about (lifestyle, little bit of fashion, motherhood, thoughts on having a medically fragile child, etc)…. but then my horrible time management issues create this barrier – and something I need to really get better at (… I’m serious – I waste so much of my day just “doing nothing”, and something Nick and I discuss often because of how bad it is). At the end of April we held a little birthday party for Evanna (already posted a few photos here), and just invited family and a few close friends. I didn’t manage to send out the “official Facebook invite” until just two weeks prior (…cause of said time management skills), but most of our family knew about it way ahead of time, and almost everyone was able to show up. I wanted to play off Evanna’s gorgeous red hair that everyone always obsesses over (myself included), and decided to do a “Strawberry Shortcake” themed birthday. It was a super long day for Evanna, but she handled herself really well and feel like she somewhat enjoyed herself. We finally put an ad up online for our basement suite the same weekend as Evanna’s birthday party, and ended up receiving an awesome response and showed it to several prospects during the first few weeks of May. The rental market is a tad saturated right now (currently a “renters market” here in Calgary)… but we priced it really well and garnered the right attention. After selecting a tenant, we had her sign the lease and pay the damage deposit early last week, and handed over the keys to allow her to slowly move her things over. We’re so excited to have this huge project behind us and are now tackling our yard (well.... Nick is). We were one of the last people to move onto our street last summer, but our first priority was developing our legal basement suite and getting it rented out. This meant that our yard had been severely neglected, and was completely overgrown with weeds…. and we had somewhat become one of “those neighbors” to say the least. It wasn’t a huge deal during the winter when the snow covered everything, but now that it’s all melted, I somewhat cringed at the state of our yard. Thankfully that all changed this past week! We have made tentative plans to finish the fence (our neighbor built the one side last summer) in August… but will wait a few more months before we officially decide what we’re going to do, and have talked about maybe holding off just one more year before we complete this particular project -- as Nick pointed out that we really don't have animals or kids we're trying to "keep in", so it's not a super vital project we need to complete this year. WE'RE SPRINTING 🎉🎉🎉 || we had an airway appointment today, and we trialed Evanna OFF of the ventilator!!! I repeat -- Evanna is now SPRINTING OFF THE VENTILATOR!!! Pictured is Evanna with just an HME (which provides humidity) and oxygen. The Respirologist felt she could handle it based off her bronchoscopy that he did back in April, and so we gave it a go (and our trach clinic RT and nurse were just as excited and surprised as we were when given the orders lol). Evanna did extremely well for about 1.5 hrs, and all her "numbers" remained within normal limits (CO2, Heart Rate, Respiratory Rate) – and in fact, her oxygen saturations consistently stayed in the high 80s and low 90s (she normally sits between 75-85 due to her heart defect). However, as we reached the 2 hr mark, Evanna's "work of breathing" was noticeably worsening and was sounding more "wheezy".... which mean some of her malacia showing and parts of her lungs were beginning to collapse, so we called it and put her back on the vent. So, based on today, we've been given permission to sprint Evanna for 1 hour, TWICE a day! We will then reassess at our next appointment​ on June 7th and go from there (ie. potentially increase the amount of time Evanna can be off the ventilator). Considering where we were just over a MONTH ago (PEEP of 12) – this is a huge win for us, and I'm extremely excited for a #ventfreesummer. Since then, we have been successful at sprinting Evanna twice a day for an hour each time – and it seems to be going real well. Due to the fact it’s obviously more work, she is napping a bit more consistently (but still have days where Evanna is a “no-napping girl”), or goes to bed earlier and falls asleep even quicker (not that this was an issue before). The true test will be if there is any marked improvement at our next appointment on June 7th and we’re approved for longer sprints. We have noticed that Evanna doesn’t like being on her back when sprinting, so she’s usually standing or sitting up – and we even use the opportunity to put her in her walker and make her walk across the house (using the tablet/movies as good ol’ bait!). Speaking of her tablet – I have to make note of this cute little thing she did a few weeks ago. Evanna has a very small selection of movies that she likes and it’s almost impossible to introduce a new movie to her (girl knows what she likes!). She was standing up against the couch, and I was sitting on the floor beside her. Nick recently added Ice Age to her movie playlist and I decided to see if she was willing to watch it. Within a minute of pressing play, she literally grabbed my arm and moved it towards the tablet in an effort to get me to change the movie to something else. Speech is still something we have made little progress on (though, the team is getting a speaking valve to try at our June 7th appointment) – but this was a new form of communication we’ve never seen come from her, and thought it was kind of neat. We’ve also been given a Cath date (finally…..) for June 14th (at one point it was originally scheduled for June 12th… but were bumped just a few days later). 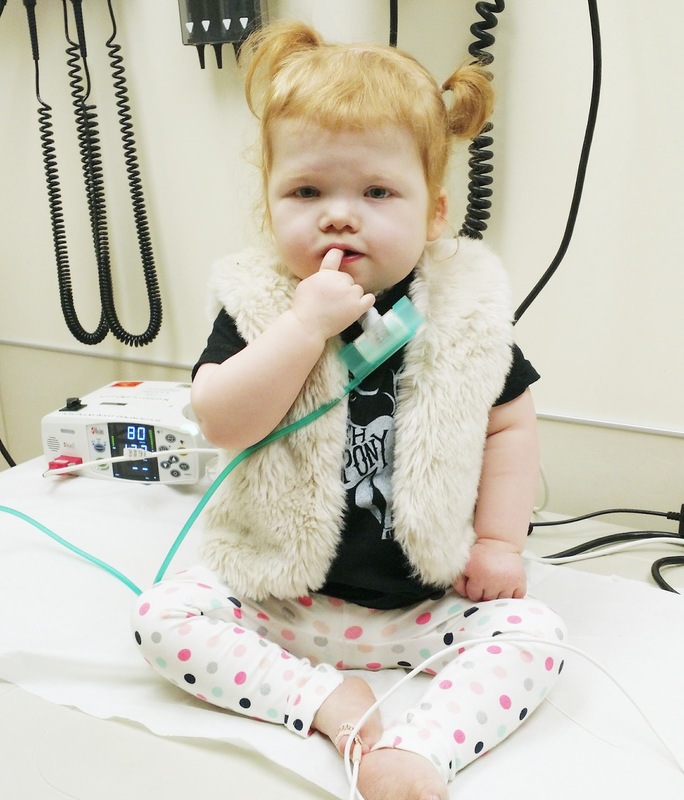 For those who don’t recall – this Cath is for our California Referral, as it was requested by Dr. Hanley to assess if there is anything he can do for Evanna. We are beyond nervous for what results will be produced by this procedure, but I’ll go into further details as to why (Evanna’s case is considered extremely severe on the “MAPCA scale”, and so we have legitimate fears that the Cath will show that her case is just too complicated – even for Dr. Hanley and she’ll be deemed “inoperable”) in a completely different post closer to the Cath. I’m currently trying to concentrate on the positives of this Cath – which of course is the fact that we get to go up to the Stollery and have a chance to see some of our favorite people and “show Evanna off” to the medical team up there lol. Despite all the progress we’ve made from a respiratory standpoint, it’s been decided that it would still be best to medically transport Evanna to Edmonton, as it would be a bit too much to go up as “out-patient” (which is what's normally done), and sit in a hotel with no access to oxygen and such (Evanna requires a LOT of oxygen…. and so we would have to luge our concentrator and tons of oxygen tanks with us up to Edmonton… yeah no bueno). Details are a tad fuzzy, but we’ll most likely get transferred up to the ICE unit on 4C on June 13th, in preparation for the Cath on the 14th. * I would also like to point out that Cath’s are extra risky for Evanna (and the reason it’s been over two years since our last one… and waited for Dr. Hanley to specifically ask for it). Cardiac Caths are generally done through the femoral arteries. However, Evanna’s are both occluded… so they actually have to go through her liver (which carries much higher risks of this already risky procedure). I’m sure they’ll do an ultrasound to double-check they’re still occluded… but it’s more than likely they’ll have to go through her liver again. Just another thing that makes Evanna extra complicated and special….oi. I promise June will be very post heavy with everything we’ve got going on…. so stay tuned! so glad things are going so well. I enjoyed catching up to hear how Evanna is doing. She is one determined little girl. Was wondering if Evanna ever received her hat from Alyssa's Handmades"? If so we would love to see a picture.